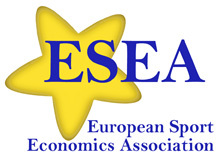 The European Sport Economics Association (ESEA) is a scientific association founded on October 4th 2010 in Cologne, Germany. It pursues the goal of promoting communications between scientists as well as between scientists and practitioners working in the field of sports economics, and of demonstrating to the fields of science, day-to-day practice, politics and the general public the benefits that are derived from appropriate research and academic education in Europe. The purpose is predominantly realized by holding an annual conference and publishing documents in the field of sports economics. From August 28-30 2019, Gijon (Spain) will be hosting the 11th ESEA Conference on Sport Economics. A special issue of the International Journal of Sport Finance, the official ESEA journal, is dedicated to publishing selected papers from this conference.